What a yummy burrito! 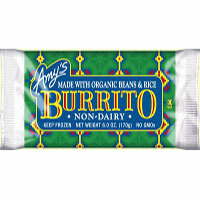 I was afraid I wouldn't like it, since I like to have cheese in burritos and this one was dairy free, but I was wrong! The wrap on the outside was yummy, and kind of tasted like the crust on Amy's non-dairy pot pie. On the inside, the burrito was stuffed with rice, beans and veggies like tomatoes, bell peppers and onions. The burrito was very soft in consistency, due to the tender beans and veggies. The burrito had a nice flavor from the spices, but wasn't too spicy at all. Overall, it was pretty filling and really delicious, and a perfect on-the-go meal!